EABASSOC Elastotherm AC is a ready to use, water-based coating giving exceptional thermal insulation, anti-carbonation and weatherproof properties. It is suitable for both internal and external use on all substrates and provides an attractive, decorative finish. 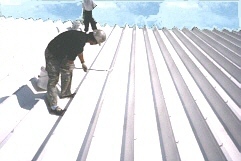 EABASSOC Elastotherm AC applied onto steel roof for thermal insulation. Elastotherm AC applied externally reduces inside temperatures. EABASSOC Elastotherm AC is easy to apply, non-hazardous and environmentally safe. EABASSOC Elastotherm AC not only gives outstanding thermal insulation results, but forms a tough, durable coating, which provides long term protection for more than 20 years exposed. EABASSOC Elastotherm AC performs exceptionally against destructive elements such as UV radiation, weathering, high and low temperatures, and atmospheric pollution. EABASSOC Elastotherm AC forms a highly durable, tightly bonded, flexible, protective coating, waterproof yet breathable, and visually attractive. When applied onto concrete EABASSOC Elastotherm AC resists penetration by water and carbon dioxide gas, thereby minimising the risk of concrete carbonation. The elastomeric nature of the product, which allows the coating to move with the substrate, and its excellent adhesion virtually eliminate any cracking or delamination of the coating. All Rights Reserved. Copyright © 1997 - 2019.